Is False Flag Weekly News about to become obsolete? CNN, which suggested the Manchester bombing could be a false flag, just dropped the word “psy-op” into its early report on this evening’s “white van and stabbings” event in London. If CNN continues to label each emerging terror drama a “false flag” or “psy-op” in their breaking news coverage, I may have to either apply for a job there, or look for another line of work. But seriously, folks…what could explain such amazing outbursts of candor from the Establishment mouthpieces over at CNN? That is why, for example, the Rothschilds’ Economist Magazine told the whole world in late 2014 that there would be two big terror attacks in Paris in 2015, and the second attack would happen on 11/13/15. Note that the digits 1 1 1 3 1 5 can only unscramble into one date in 2015: 11/13/15 (or 13/11/15 in the European system). 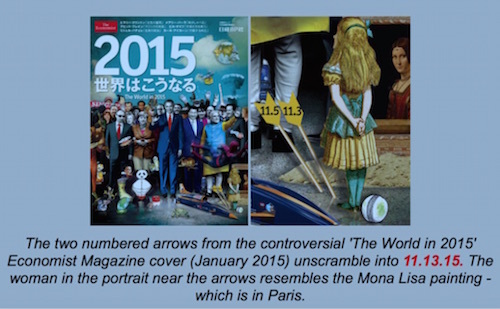 That happens to be the date of the second (two arrows) big attack in Paris (Louvre painting – not the Mona Lisa but another Da Vinci). 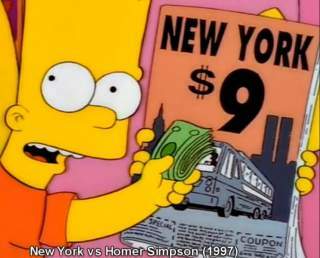 Other well-known examples of false flag terror perps telling us what they’re going to do include the famous Simpsons 9/11 imagery, the Lone Gunman TV series, smearing the Brussels Airport logo in blood all over the floor of the Bataclan to signal that the next false flag would be in Brussels, and on and on. Ole explains that the bizarre superabundance of obvious evidence that 9/11 and follow-up false flags are inside jobs may not be a sign of incompetence. Instead, he suggests, the perpetrators intentionally fail to hide their tracks, in accordance with their occult believe that to do so absolves them of karmic guilt. I will be busy presenting at the Left Out Forum tomorrow – watch the livestream HERE – so I won’t have time to scour the internet for evidence that this attack, like the previous ones in Manchester and Westminster (not to mention Paris) is a false flag. But since all such events are now presumptive false flags – even CNN is jumping on the bandwagon – I think we can assume that this one, like the previous one in Manchester, was a Gladio B operation designed to throw the British election to Theresa May and stop 9/11 truth supporting anti-Zionist Jeremy Corbyn.